I got a super duper, high-powered blender: a Vitamix Super TNC 5200. And I’m in love. I knew I’d love it, but I didn’t know I’d love it this much. It’s awesome for smoothies (duh!) but I also use it at least once more nearly every day for sauces, soups, spreads, desserts… in other words, all kind of prep work and kitchen fun. I also never expected it’d replace pretty much all of my favorite kitchen appliances, or at least fill them with envy. It’s kind of crazy how I just don’t need my small or large food processor anymore, and even my trusty coffee grinder, which I used daily for grinding nuts and spices has taken a back seat. Poor guys! Anyone want a used blender / food processor? Seriously, come and pick it up in Berlin. Let’s be honest. These things are pricey, especially if you live in Europe, as I do, and get these goodies as imports from the U.S.. I keep telling people when they ask me: Could it possibly be worth the investment? Well, if you cook and blend a lot, and if you love smoothies; Yes. Find the funds, take the plunge. (In the intro to my cookbook, I talk about getting the best tools you can afford, and considering practical needs, priorities, as well as budget.) Soon, you’ll be wondering how you ever lived without a power blender. All the blenders I had over the years were difficult to clean and I avoided using them. This one’s a totally different story: Simple to clean and practically indestructible. It’s fun. It’s awesome. Since I love to travel, I’m already starting to wonder how I’ll feel when I leave home for a few weeks or months (for example, this coming winter during my planned Mexico trip) and won’t have my beloved smoothies just about every morning. I guess I’ll be back to the stick blender, which fits well enough in my backpack and does the job. After all, I got by in India for a year without a juicer, and the stick (immersion) blender and small food processor I got there were enough. For several weeks in Africa I was always able to get by with a simple citrus press. So yeah, I’ll survive. Enough about the blender! Give me the smoothie! 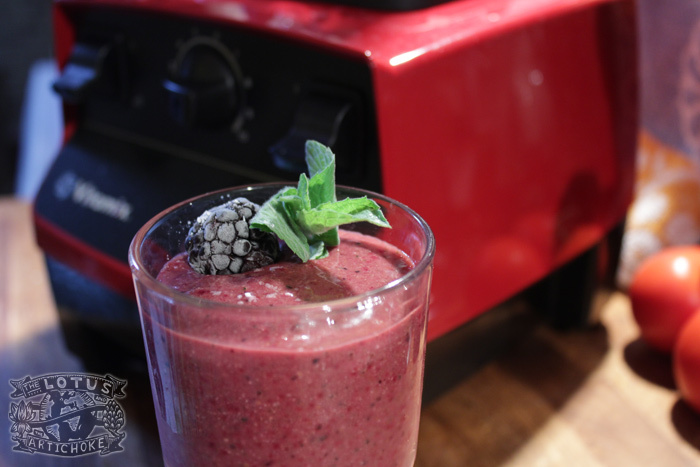 This smoothie recipe, a Blackberry Beet Smoothie (with lots of other fun stuff in it, too) is part of a series of smoothies I plan to post about. Many of them have stories that relate to my travels and places I’ve lived in the 40+ countries I’ve seen. But this one is just fun and delicious. I’ve always loved beets and berries. I could talk about how beets remind me of India and berries about my childhood days of scouting trips in the forests of Northeastern America. Nah… Let’s get on to the tasty stuff. If you don’t have a power blender (yet), you could make this with a standard blender, or even an immersion blender. Just chop the stuff well, and soak the nuts and seeds longer. Or use cashew butter. Be creative, have fun. It’s your smoothie now. Enjoy! Soak cashews and flax in water for 15-30 min. Or just add to blender while prepping other ingredients. Add all ingredients (including cashews + flax) to blender. Blend 20 seconds on low, pulsing to chop and purée. Add slightly more water or soy/nut milk if desired. Increase blender speed, Purée on medium high until smooth (20-30 seconds). Dried Fruit: Figs or dates can be replaced with raisins, dried cranberries, or other dried fruit of your choice. Chia: Replace flax with chia seeds. Ginger power: Add 1/2 in / 1 cm fresh ginger. Greener: Add a handful of fresh mint, parsley, basil, or wild greens. Nuts: Replace with sunflower seeds, walnuts, or 1/2 banana. This entry was posted in Raw, Smoothies & Juices and tagged beet, blackberry, flax, smoothie, vegan. Bookmark the permalink. I love this recipee! will go and give it a try this weekend – of course in my beloved Vitamix :-)))! What an amazing color! I love it. 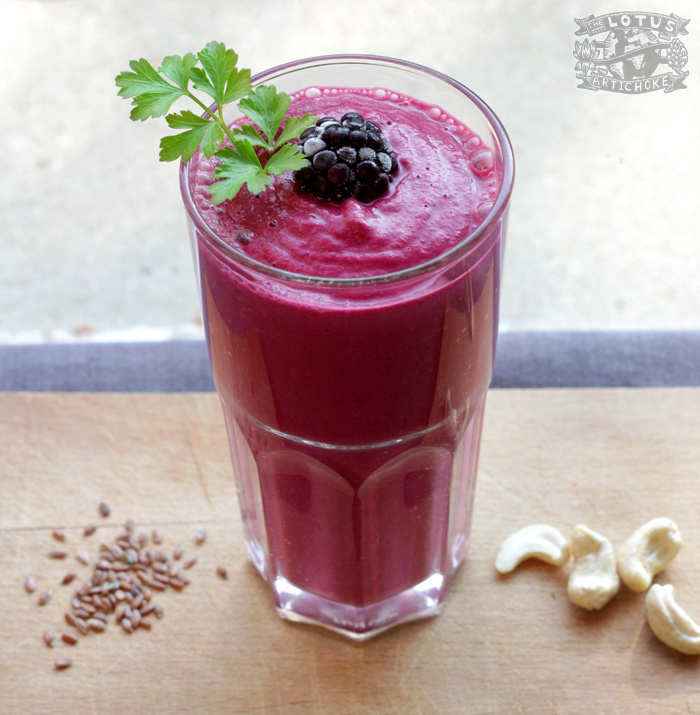 With the soaked cashews, I bet this is a super filling smoothie to last you the whole morning! Thanks, Eileen! Indeed… after a smoothie like this usually *is* breakfast, and I’m fine until noon or 1! Wow, you’re so creative – I’ll have to try adding beets to a smoothie! Is the beet raw or cooked? Thanks! I am jealous of everyone who has a vitamix! Luckily, my magic bullet suffices, just not enough for some of the amazing smoothies I find! I think I’ll have to juicer eh beet first before trying this, but I will – and I think it’ll be pretty good! Laura, I was envious of my power blender friends for a while, too. :) You could juice the beet first, or chop it up well — or even steam it — before blending it. Let me know how it works out. With my previous blenders I never really tried to smoothie-ize things like carrots and beets. The fancy blenders can liquify pretty much anything though… it’s amazing. I’ve got a standard blender, so i’d love to know if i can put a raw beet into it? Maybe i should boil it first…and i know that juicung the beet would leave out the most important component -fibers..
Hi Sanja, cooking the beet first would probably work best with a standard blender, but you could certainly try just grating it first.